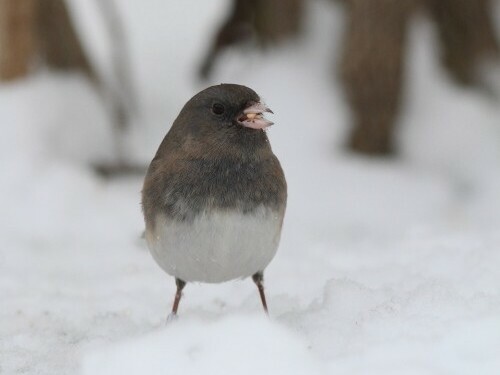 One of the unusually many Slate-colored Juncos wintering at MBO this year. Notes: 2011 at MBO got off to a relatively slow start, with just four species observed during our first visit on January 3. However, over the course of a dozen visits this month, the species count grew to a total of 25, including four seen for the first time this winter: Sharp-shinned Hawk, Golden-crowned Kinglet, and both Bohemian and Cedar Waxwings. The kinglet was the first one ever observed at MBO in January. Only four species were observed on all visits this month: Black-capped Chickadee, American Tree Sparrow, Slate-colored Junco, and American Goldfinch. Unfortunately it remained cold throughout the month, so there were no opportunities for winter banding, but we hope to have an opportunity for that in February. Black-capped Chickadee and Slate-colored Junco remained in the top three, typical both for January and for this winter overall. 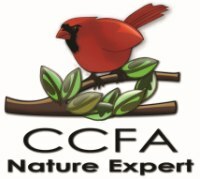 The big surprise was Cedar Waxwing in second place, since this marks only the second time in seven winters that we have observed them in January at all. A modest group of six was first observed on January 11, then larger numbers were observed on all five visits between January 19 and 29, with counts between 32 and 69 on four of those dates. Meanwhile Bohemian Waxwings peaked from 35 to 60 individuals between January 6 and 19, then tapered off with only two lone individuals later in the month - also a bit surprising since traditionally their numbers at MBO peak in late winter. European Starling rounded out the top five this month, largely on the strength of two large flocks of 35 and 60 on January 4 and 6. Also of note this month were the finches. As noted previously, American Goldfinch was one of just four species observed on every visit, and just barely missed the top five for the month, with an average count of 8 individuals. After a couple of mid-month sightings of Common Redpolls (3 on January 11 and 1 on January 19), a flock of 20 arrived on January 29, hopefully a sign of things to come as we head into the late stages of winter. But perhaps the biggest mystery is the complete absence of House Finches, especially considering how numerous they were in November. To a certain extent this mirrors past years when they dropped off in abundance in mid-winter, but never before have we missed them entirely in January. Already we're thinking ahead to finding a way to study this puzzle in greater detail next winter! Two (yes, the tail counts!) 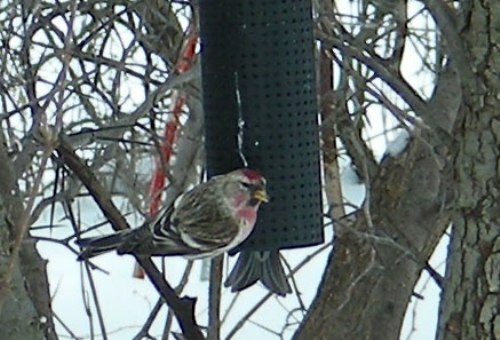 of the flock of 20 redpolls that arrived near the end of January.